The showiest section of the garden is usually right out there in the full sun. Keeping a section clear from the shade of buildings and large trees to give these sun loving plants a spot to shine is reward enough. Keeping this section of the landscape from wearing out the water meter is another issue. Soil preparation is key to keeping even thirsty plants from sucking the meter dry. But most of the rest of the plants appreciate a well tended soil as well. A season or two with a thick layer of mulch yields results much like those of double digging. Fertilizing encourages the bacteria to work overtime and all of that organic material that gives soil the looseness gets turned back into more bacteria. In this world of increasing automation it is easy to program the timer to provide enough water so that even the thirsty plants are quenched. One of the most surprising lessons in my gardening career was when the local municipality told us to turn off all sprinkler systems. Predictably the lawns turned brown and crunched while you walked on them. The surprising part to me was how many plants actually did better. For years we have had drought tolerant plants produced by our local nurseries that were often over-watered and rotted in our landscapes. Look to our review of Smart Sprinkler Timers. Plants do not fare well with the chloramines and other water sanitizing chemicals. No surprise, the point of the chemicals is to kill the microscopic plants and animals that might make us sick drinking the water. The result so far as the plants are concerned, an inch of irrigated water or an inch of rain on the landscape does not produce the same results. It is easy to see how happy the plants are when we finally get the natural choice. I spend a significant part of my time in gardens trying to fix the soil chemistry caused by our water. 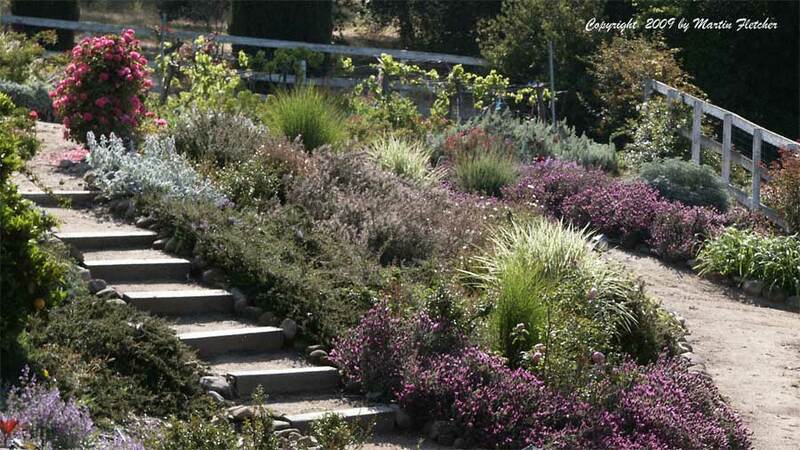 The Garden pictured above is planted in Ojai in a cold section of the Valley on a South exposure. This picture was taken in the early morning in May. The following plants are what you can see in the garden. In addition there are a dozen or so different daylillies, the Rose 'Fairy' and a truckload of rock garden perennials tucked around in the nooks and crannies. The rose on the fence in the background is Rosa banksii Snowflake. Our full sun garden list is compiled from the plants that we have enjoyed in our sun filled gardens.